E3 2018 is in full swing, and that can only mean one thing: all the big names (that’s Microsoft, Sony and Nintendo to you and me) have descended on Los Angeles, California to show off their latest games and innovations. Sony may have announced it was only focusing on four games at its show - The Last of Us Part II, Death Stranding, Ghost of Tsushima and Spider-Man - but that doesn’t mean the event was predictable. Ellie provided one of PlayStation’s most unique female leads when she joined Joel for The Last of Us in 2013, but considering her young age at the time of the first game, it fell to the game’s brilliant single-player DLC for a brief hint at her burgeoning sense of self. Not so for The Last of Us Part 2 - the first demo premiered showed Ellie going up against a murderous cabal of cultists, but it was framed around her in tentative yet intimate slow dance with a female admirer. Considering the lack of LGBTQ+ characters in games, developer Naughty Dog has made sure that while Ellie’s orientation isn’t her defining feature, it’s still one that’s presented front and centre. Much like the first game, the world of The Last of Us 2 is fraught with dangers at every turn. In the gameplay demo showcased at Sony’s E3, Ellie finds herself descending into the ritualistic butchery of some crazed cultists. Outnumbered and outgunned, Ellie will need to use her environment to distract and stealthily take on foes, using long-grass and scenery to navigate the much larger environments Naughty Dog has built for the sequel. Crafting once again returns, as does the need to scavenge, as bullets and arrows are scarce. We see Ellie often grabbing resources on the fly while trying to survive. 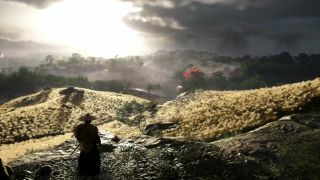 The new game from inFamous developer Sucker Punch is set on the island of Tsushima, which finds its idyllic setting put to the sword as the Mongols begin invading Japan in 1294. The protagonist is a lone samurai who finds himself having to lead a one-man war against the Mongols, as he attempts to halt the tide of invaders. As a setting, Tsushima offers an incredible backdrop, full of open-fields, forests, rolling hills and villages. It’s like playing through a classic Japanese painting, with cherry blossoms falling as you enter into a deadly duel with another sword-wielding warrior. One interesting aspect of Ghost of Tsushima was how its sword fighting has a precise look to it. Failing to block or mistiming a strike can have devastating consequences, creating an intense showdown somewhere between Dark Souls and Bushido Blade. Developer Sucker Punch brought experts in kendo in to consult on the combat, ensuring that each fight feels like a conversation as much as a fight. Parrying plays a big role, as does using momentum and footwork to outmanoeuvre enemies and deliver that killing blow. We don’t know if it’ll be Dark Souls levels of punishing, but we’re excited to see swordplay being treated with a little more reverence. While it said it would be focusing on just the four games for its E3 2018, Sony still had a couple of surprises to show off in between those longer and more in-depth demos. Which just so happened to include the much rumoured (and hotly anticipated) remake of Resident Evil 2. The 20-year-old horror title brought horror into the mainstream and made icons of stars Clare and Leon, so what better way to celebrate that legacy with a fully remade return to Raccoon City? And it’s due on 25 January, 2019, so there’s not even that long to wait. While it’s been busy working on Sekiro: Shadows Die Twice - a new game set in Feudal Japan very much in the vein of the Souls series - Japanese development powerhouse FromSoftware has also been building a new experience for PSVR. As with much of the studio’s work, we don’t know know much about the game yet, other than it’s got a Victorian-style mansion setting with talk of fairies and other fairytale creatures. However, considering the pedigree at work at the studio, we’re positive this will be a VR experience worth strapping in for when it eventually arrives. If you’ve been attempting to understand just what Hideo Kojima has been up to with Death Stranding, the demo shown at E3 2018 won’t provide much explanation. It did, however, offer a little insight into some of the things you’ll be doing as Sam, the lead character played by The Walking Dead’s Norman Reedus. The Icelandic-esque setting will offer some incredible vistas to explore, with Sam scaling huge cliff-faces and more. We also got to see a little more of the invisible enemies he’s up against, with the ‘baby in a jar’ feature enabling him to briefly see them. Yes, we know how weird that sounds, but just go with it. Nioh might have been a pretty shameless Dark Souls clone, but it was by far one of the best, offering an intriguing take on Feudal Japan and Japanese mythology. The action role-playing game proved a big hit, so Team Ninja is back with a second round of merciless combat and giant, demonic bosses. There’s no new details released just yet, bar the tagline of ‘Defy death/death defies you’, but we’re expecting even more over-the-top action. It’s currently in development for PS4, but there’s no word yet on whether it’ll be making the jump to other platforms as well. Insomniac's take on the Friendly Neighbourhood Spider-Man won’t be another origin story, instead it’ll be set around eight years into his career. So when Electro finds a way to free every prisoner on the The Raft, Spidey finds himself having to go head-to-head with many of his most iconic villains. We’ve already see Scorpion, the Vulture, Rhino and Mr Negative (with even more teased by the time the main demo plays out). Insomniac is promising a chance to play a Spider-Man at the height of his powers, which makes us very excited indeed. Considering the melee focus and the distinct use of combos, it’s difficult to see Spider-Man’s combat play out and not be reminded of the Batman: Arkham series and its Freeflow Combat system. While Spider-Man does share a few key elements - such as bouncing between enemies to chain combos and using gadgets to take groups of them down - it also has plenty to call its own. The Focus Bar is one fresh addition, a mechanic that builds up over time and can be used to either heal Spidey in the heat of battle or be used to pull of powerful finishing moves to bring a brawl to a spectacular close.